Sold by the U.S. yard with special pricing for larger quantities available, this ribbon is available in a variety of different widths. As with all our ribbon, it is is a top quality, authentic Scottish tartan ribbon as certified by the Scottish Tartans Authority that we import from Scotland. A modern tartan, thoughtfully researched and designedeach colour in the Cornish National Tartan has a special meaning: the single white overcheck on black creating the cross of St. Piran's banner, the flag of Cornwall. Legend says the colours came about when St Piran (the patron saint of tinners) watched molten tin spill from the black ore in his fire. The black and gold are the colours of the ancient Cornish kings; the red is for the beak and legs of the Chough (the Cornish national bird) and the light blue is for the sea, which surrounds Cornwall on three sides. All this has been lovingly and beautifully been rendered into this new ribbon ! This is the popular Buchanan Clan variant, first officially catalogued in 1850, although the origins of the tartan itself are much, much older. Sold by the yard with special pricing for larger quantities available, this ribbon is available in 5 different widths. As with all our ribbon, it is is a top quality, authentic Scottish tartan ribbon as certified by the Scottish Tartan Authority that we import from Scotland. Sold by the metre with special pricing for larger quantities available, this ribbon is available in 4 different widths. As with all our ribbon, it is is a top quality, authentic Scottish tartan ribbon as certified by the Scottish Tartans Authority that we import from Scotland. 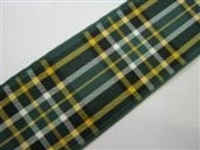 Celtic FC Tartan is no longer currently produced in ribbon at this time. 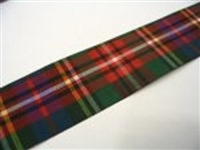 However, the available Irish National Tartan Ribbon is a possible alternative ! 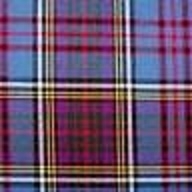 An excellent alternative for the Cornish Hunting Tartan, this MacKenzie is the modern variant worn by the Seaforth Highlanders. Also available in a lightweight taffeta under Clan Robertson. One the most recognised of all Scotland's. 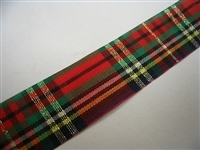 The Dress (Royal) Stewart Tartan Ribbon is, in essence, the same tartan as the Royal Stewart but set on a white background as opposed to the Royal Stewart's red background. The Dress Stewart is worn for special occasions, especially weddings. As a variant of the Royal Stewart, is a Royal Tartan of Scotland and one of the tartans worn by Her Majesty the Queen and members of the British Royal Family. By extension, is therefore also a British Royal Tartan and as subjects of the Queen, all UK citizens, all citizens of the Commonwealth and their descendants are entitled to wear the Dress (Royal) Stewart tartan. Dress Stewart is also available in an Organza ribbon. Sold by the U.S. yard with special pricing for larger quantities available, this ribbon is available in a variety of widths. As with all our ribbon, it is is a top quality, authentic Scottish tartan ribbon as certified by the Scottish Tartans Authority that we import from Scotland. The Fraser Tartan Ribbon we offer is the variant commonly referred to as the "Red Fraser", first catalogued in 1842, although the origins of the tartan itself are claimed to be centuries older. The Gordon Tartan Ribbon here is as worn by the Gordon Highlanders, the Highland regiment raised in 1881 and amalgamated with the Queen's Own Highlanders, Seaforths and Camerons in 1994 to form the British army's only highland regiment: The Highlanders. 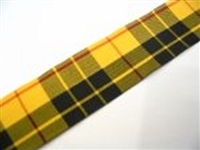 The dark green and blue undercheck is the Black Watch or Government tartan with a single gold overcheck. "there's nae yellow in the Gordon!" and the overcheck is always referred to as gold! The price of Hibernian FC Tartan Ribbon is considerably higher than most other tartan ribbon partly to do with licensing arrangements with Hibernian Football Club. Because of the price set by the manufacturers for us to obtain and sell it, we do have to price it according but tried to be totally fair and offer it at the best we can. Nonetheless, Hibernian FC Tartan Ribbon is an extremely rare, premium tartan ribbon, officially licensed by Hibernian Football Club and produced as one of the Pride of Scotland range. As it was originally commissioned for use as a Christmas ribbon and based on the MacKean tartan,the Kemp tartan ribbon it is not totally authentic, but with its gold lurex thread woven through a taffeta base, it is a particularly lovely decorative tartan ribbon. Taffeta tartan ribbon is a finer-weave, has heat-sealed edges and is cut from wider material so, if bought in bulk, each spindle may show a different part of the sett. Please note that this is currently the only Kemp Tartan Ribbon currently produced. Currently the only MacDonnell Tartan Ribbon currently produced, and is a heat sealed edge taffeta. There are many variants of the MacLeod Tartan - We offer the MacLeod of Lewis (MacLeod of Lewes), registered in 1842 also referred to as the Dress MacLeod, based on the MacLeod Snuffbox, registered in 1829, and commonly known as the "Loud MacLeod". We also offer a taffeta variation with a slightly different colouring for large bulk orders in a 12mm and 38mm width. Sometimes referred to as the Menzies "Mourning" Tartan , this Menzies Tartan Ribbon was used for all special family occasions, not only funerals, but weddings and other important ceremonies. With only two colours in the weave, the Menzies Tartan is derived from the simple sett of some of Scotland's most ancient tartans. Black Watch Wired Edge tartan ribbon with silver and gold edges is also available but this ribbon is now extremely rare and stocks diminish quickly. This MacBeth is the only Macbeth ribbon in production and is a taffeta ribbon with heat sealed edges. THIS ITEM IS CURRENTLY UNAVAILABLE AND AT THIS TIME WE HAVE NO IDEA HOW LONG BEFORE IT WILL BE AVAILABLE AGAIN. SIGN UP FOR OUR NEWSLETTER AND ASK TO BE NOTIFIED. Originally commissioned for use as a Christmas ribbon the MacKean tartan ribbon it is not totally authentic, but with its gold lurex thread woven through a taffeta base, it is a particularly lovely decorative tartan ribbon. Taffeta tartan ribbon is a finer-weave, has heat-sealed edges and is cut from wider material so, if bought in bulk, each spindle may show a different part of the sett. Please note that this is currently the only MacKean Tartan Ribbon currently produced. The Modern MacKenzie was worn by the Seaforth Highlanders and features a single white and single red overcheck, set against the famous dark blue and green undercheck of the Black Watch. 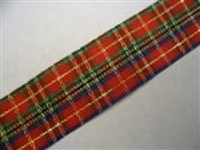 MacKenzie Tartan Ribbon is also an excellent alternative for the Cornish Hunting Tartan and the Scottish National tartam and a lightweight MacKenzie "Taffeta" Tartan Ribbon is also available in Clan Robertson.